Jeff grew up water and snow skiing in Michigan. He studied Marine Biology at Michigan State, but decided after some time that business courses might be better for him. He managed Kmart stores for 14 years and then many years restoring, repairing, and tuning vintage race cars. As his children grew, he hiked, biked, kayaked, camped and climbed with them. Since moving to Alabama in 2004, Jeff worked in Statewide Workforce Development, followed by several years as Case Manager at a small law firm in Montgomery. 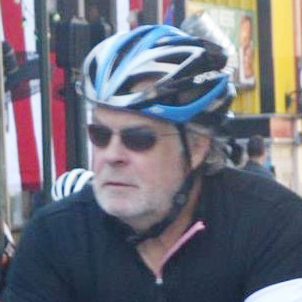 He is the past President of the Montgomery Bicycle Club. While actively supporting any and all bicycling events, Jeff’s focus is on the unrealized potential that cycling has on regional and statewide economic and tourism development. Jeff believes that there is a huge opportunity for AlaBike to connect, advocate, and empower bicycle clubs, organizers and individuals, as well as non-cycle related advocacy groups statewide for increased awareness of bicycling benefits. Jamie has been a resident of Alabama for most of the past 3 decades, but she grew up a cyclist in Minneapolis and lived and cycled for several years in the Seattle area before moving to Huntsville. Although Huntsville’s center city street grids, weather and traffic make bicycle commuting pretty easy in some parts of the city, the lack of cycling infrastructure across the state is a huge impediment to more people enjoying her favorite pastime and form of transportation. In 2003, with the help of a handful of others from Huntsville, she founded the Alabama Bicycle Coalition in an effort to spur the development of more bicycling friendly communities in Alabama. It has been difficult to effect change. Jamie came to the Rocket City to build the International Space Station for Boeing. She has been employed in engineering ever since. She is a bike commuter more days than she drives, mountain bikes and rides centuries and metric centuries 3 seasons a year. She is a member of the Spring City Cycling Club, has held several officer positions and is currently the Community Affairs Officer. She is also a perennial member of the Huntsville Bicycle Advisory and Safety Committee (BASC) and encourages other local cyclists to get involved in their local municipality. Regi’s first introduction to cycling was in 2010, when she joined the Spring City Cycling Club after moving to Huntsville in 2005. This was an excellent “move” that satisfied her desire to become a road cyclist and also to connect to people and make new friends. She’s edited the club newsletter since 2011, and was introduced to AlaBike via mutual SCCC board members Jamie Miernik and Morgan Andriulli. In 2015 she became the treasurer for the organization which led to a much-increased awareness of Cycling Advocacy and the need for it in Alabama. She enjoys recreational riding, organized centuries (mostly metric distance) or out-of-town rides, any top trails on her mountain bike, hiking, an occasional kayak trip on flat or moving water, and travel to interesting places near and far. In her other life Regi is the Contracts Department Administrative Support for Dynetics in Huntsville. Peter Bain is a graphic designer, typographer, and educator in art and design. He began his professional career working on Madison Avenue and 59th Street in Manhattan. He has received national recognition for his work, and completed a brand signature redesign for AlaBike. Bain's teaching experience includes a range of universities and colleges, from urban areas to rural communities in the South. Jeff DeQuattro is the founder and Executive Director of the Delta Bike Project in Mobile, Alabama, which opened its doors in July 2013. Jeff has helped to usher Mobile into a new era of Greenway planning initiatives, trail implementation, and new bicycle infrastructure and amenities, all of which have significantly increased the number of people on bikes, and their safety, in Mobile. The Delta Bike Project provides a free space and tools that anyone can use to learn how to fix their own bicycles, and has a program that allows people at-or-below the poverty line to earn bicycles through community service. Jeff works full-time for The Nature Conservancy as the Director of Restoration for the Gulf of Mexico Program and sits on several Mobile-based and state-wide boards including the Alabama Trails Commission Advisory Board as a representative of The Alabama Bicycle Coalition (AlaBike). Also, Jeff was recently recognized by Southern Living Magazine as "A Southerner of the Year".